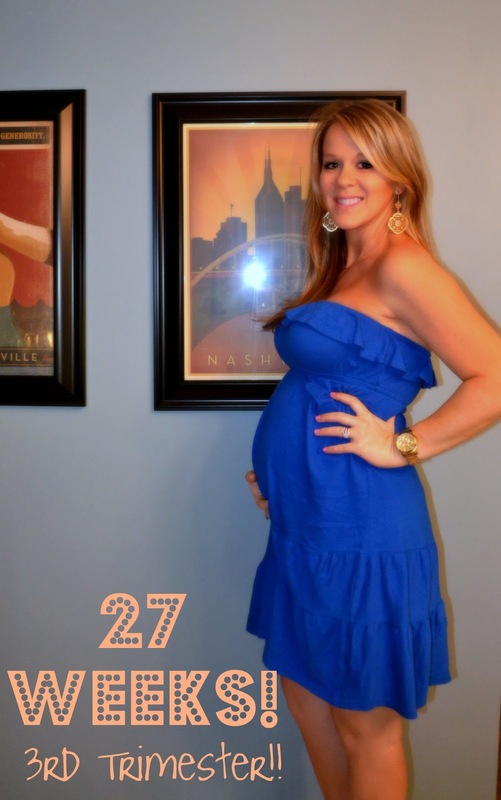 A Lovely Little Life: 27 weeks - BIg Week!! Weight Gain? I go to the doctor next week....lets say 19?? Sleep? I have my moments, I am very tired these days. Movement? I can't get enough of it! I thought she was starting to slow down because she was running out of room, but then yesterday she was all over the place. I LOVE it! What I Miss? my waist....looking at all this pics from the wedding when I was at my smallest makes me miss it! Symptoms? still lots of heartburn, sore feet...and they start to swell by the end of the day if I am on them too long..I hate it! Adorable dress! Even cuter with your baby belly! I just love these posts. I'm so excited for you!!!! You look great! And I have the same picture!! Love all the Nashville prints!